Plot: When fellow villagers accuse young Shula of being a witch, opportunistic civil servant Mr. Banda sees her potential as a national celebrity and takes her on tour across the country. But once the novelty wears off, Shula realizes that being perceived as a Witch is not all that it’s cracked up to be. The only character in I Am Not A Witch that is not in some way passive is the greedy opportunist Mr. Banda (Phiri). He puts in the effort to make our protagonist Shula a star, and then benefits from her fame. He is able to do so because Shula doesn’t resist, and the people of the non-descript country in which the film takes place can’t be bothered to change the status quo. It’s not worth the effort to question Shula’s abilities, or whether her exploitation is right or wrong. The film opens with tourists, both black and white, ogling at a group of “witches” sitting on the ground, behind fences, restrained by white ribbon so they cannot fly away. This sets the tone for an absurd comedy that perfectly demonstrates, in a ludicrous way, how our collective human apathy causes much of the bad that happens in this world. Welsh-Zambian Director Rungano Nyoni intentionally created a world slightly removed from reality so she could get away with more. There is more than a touch of Monty Python and The Life of Brian about this film, which is apparent from the start in a wickedly funny scene where villagers — including a man with all his limbs intact who blames Shula for taking one of them away — accuse Shula of witchcraft. Life of Brian exposed, to comedic effect, those who use faith as an excuse for their actions. Similarly, I Am Not A Witch challenges both characters and audience to call out constant absurdities throughout its running time — but nobody ever does. In today’s world, where a “new normal” is being created at an alarming rate, things that we once thought unacceptable are now being accepted, and it may already be too late to undo the work of the psychotic spreaders of division in our society. On that thread, I Am Not A Witch could be seen as depressing vision of the future outside of Africa, in the same way that Mike Judge’s Idiocracy depicts a futuristic America. In both those films and our real world, many individuals seem willing to accept increasingly ridiculous notions. There is no voice of protest in I Am Not A Witch, and only at the film’s end do we see an act of rebellion against the world order. Even then, it has no impact on the gullible and the apathetic. They will continue about their lives, because they are not being accused of witchcraft, and revel in the entertainment value of those who are. 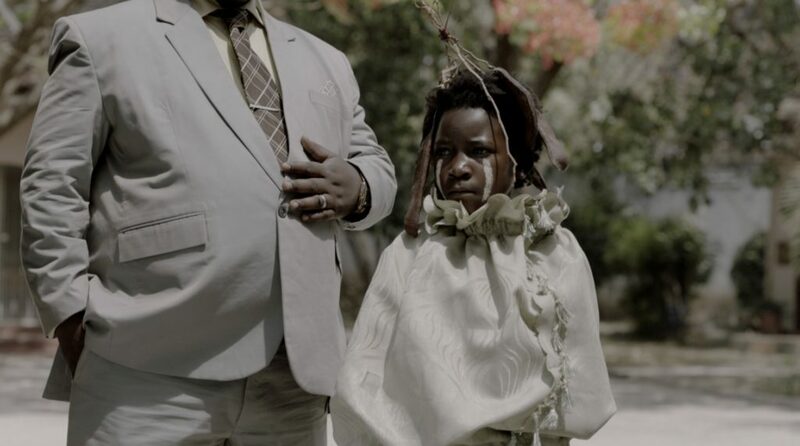 In I Am Not a Witch, the fictional country’s citizens take anything that Shula and Mr. Banda say as gospel. This has parallels with the mass consumption of reality TV, which claims to present real life but is in fact every bit as scripted as narrative fiction. It has parallels with a rabid fanbase for a world leader who spouts lies on Twitter. A non-descript, heightened reality somewhere within Africa that seems like a Monty Python film is essentially a mirror to modern society. Anyone hoping for a realistic look at Africa’s relationship with Witchcraft will be disappointed. Director Nyoni has stated that she took some inspiration from real life, but more tellingly from folklore she heard as a child. She takes these stories of her youth, injects them with a very distinctive strain of Zambian humor, and uses it to comment on how dangerously accepting we are of the new rules that those in power make and feed us via the internet. If we aren’t careful, we will become like the witnesses to Shula’s exploitation. We’ll believe everything we’re told, and we won’t care if it’s true or not because it’s so much easier and more enjoyable to go with the flow. I Am Not A Witch–Zambia, United Kingdom. Dialog in English and Shona. Directed by Rungano Nyoni. First released October 2017. Running time 1hr 33min. Starring Maggie Mulubwa, Henry B.J. Phiri, John Tembo.